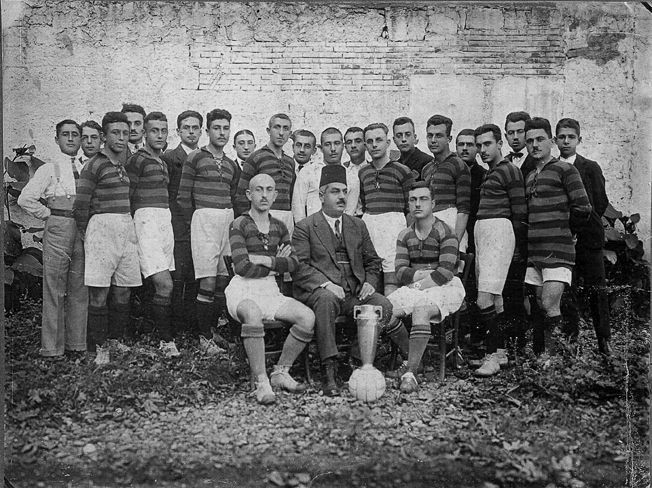 Photo of the first football team of Trabzon, in 1921 as ‘İdmanocağı’. John McManus’s talk, based on his doctoral thesis and forthcoming book, concerning the history and culture of football in Turkey. This was based on one chapter of the book, investigating the history of Trabzon as a footballing city. From the game’s origins among expatriate and minority communities through to the position of Trabzonspor now as a symbol for Trabzon, the Black Sea and Anatolia in general, it charts the ebb and flow of the city’s influence, and how this feeds into the football team and its supporters. ‘In Search of the Real Turkish Football’, will be coming out with Orion Books in April 2018. 1- You received your PhD from the University of Oxford in 2016 with your thesis, entitled, Playing the game: a study of transnational Turkish football fans, imaginations and the internet which explores how the internet affects the generation of football fan clubs in the Turkish diaspora. Do you think Turkish diaspora fans are distinct from other diaspora fans? And if so what do you put this down to? For me, what distinguishes fans of football both in Turkey and in the diaspora is the passion and enthusiasm with which they consume the game. My country, the UK, prides itself on being ‘the home of football’, but belonging to a club is a far more sedate and internal marker than in Turkey, where one’s affiliation is externalised on flags hanging out of windows, stickers on cars and ties worn to work meetings. It is hard - perhaps futile - to tie this definitively to a reason. But I suspect it is linked in part to the relative importance of groups in Turkey - a country where the collective is given greater weight than the UK and, as such, people often feel more commited to the ‘we’ than the ‘I’. In terms of the difference between fans of Turkish football in Turkey and those in the European diaspora, I find in general the latter to be even more committed to their chosen Turkish club. Football support is a key practice by which people maintain a connection to their land of birth or, if they are born in Europe, create a link to their ancestry and heritage. Football support therefore takes on almost existential importance- as a reminder of where one is from, a proud marker conveying the prestige of difference (in Europe) and belonging (in Turkey). 2- You are planning to publish a book on this subject. How extensive will the subject matter be, in that will it explore the origins of football in Turkey and how it spread from the other diaspora communities, namely the British of Istanbul and other port cities? Do you think there is an irony and perhaps a message here? My book’s starting point is the image of Turkish football in the UK. When I mention the topic of my research to people back home, they often respond with references to the ‘Welcome to Hell’ banners used to greet Manchester United in Istanbul in 1993 and the awful and sad incident in April 2000 when two Leeds United fans were killed by Galatasaray supporters. The book deals with those events, but then progresses to show the myriad other ways in which football is part of life in the country – from structuring the geography, rhythms and leisure practices of citizens to how it affects the economy and relations with Europe. Within the story, I do look at the origins of football in Turkey which, as you point out, initially arrived with British in the port cities of Izmir and Istanbul. In the ‘classic’ narrative, football quickly became a device by which different ethnic groups engaged in a proxy battle, culminating in the eventual victory of the ‘Turks’, both in the war of independence and on the football pitch. Recent research, however, has revealed that there was much intermingling, swapping of players and shared ideals of gentlemanliness and moral improvement that transcended ethnic and religious lines. One of the first Turks to play the game, Fuat Hüsnü, went by the nickname of ‘Bobby’, and later spent some time playing football in England. When Galatasaray became the first ‘Turkish’ team to win the Istanbul league in 1909, sat in the front row of the victory photo was none other than Horage Armitage, an Englishman who acted as their coach. I think the overall message to take away is that football both sharpens and melts distinctions. Both researchers and readers need to bear in mind that focusing on only one of these effects is like looking at a jigsaw with missing pieces. 3- On the Turkish football diaspora fans you concentrated on the supporters of Beşiktaş club in London and Cologne. Was there a specific reason you narrowed this research to this team and cities? I started in London because I was living there at the time, and already knew Beşiktaş supporters in the city. Whilst London has sizeable communities of Turkish-speaking football fans, it pales in reflection to Germany, where over three million people have recent links to Turkey. In order to get a better idea of the phenomenon of diaspora football support, I knew I needed to spend time in Germany. Research on Turkish speakers in Germany has disproportionately concentrated on Berlin. But the region with the largest population of Turkish speakers is actually North-Rhine Westphalia, in which Cologne is the largest city. In order to redress the balance – I settled on Cologne. Such multi-sited fieldwork allowed the study to be truly continent-wide, allowing me to draw comparisons and trace links across national borders. 4- You seem to have also dedicated a section of the book on the history of Trabzon as a footballing city, and you see this team as an emblematic symbol of the Black Sea people and how it charts the ebb and flow of the city’s influence, and how this feeds into the football team and its supporters. Why do you think Trabzon fans stand out apart in their devotion to their team? I wrote a chapter on Trabzon because the city’s football team, Trabzonspor, is the most successful after the ‘Big Three’ Istanbul clubs of Galatasaray, Fenerbahçe and Beşiktaş. But before heading to Trabzon, the stories I was reading were less about the team on the pitch and more the antics of the club and its fans. There were stories about an angry club chairman who locked a referee in the changing rooms, and a fan who jumped onto the pitch and attacked a referee. I wondered why it was that Trabzonspor seemed to have more of these stories than other football clubs. After spending time in the city, what I realised was that the story of Trabzon and Trabzonspor is emblematic of a wider issues in the Black Sea region; that is, declining economic opportunity being fertile breeding ground for quite strong streaks of nationalism and intolerance, flecked with not insignificant amount of anger. As a universal touchstone for the city and the region, Trabzonspor frequently acts as the lightening rod for these emotions, meaning they find an outlet at games and amongst fans. Trabzonspor are also intimately tangled up in the Match-fixing scandal that erupted in Turkey in 2011. Fenerbahçe beat the club to the title that year, but then were accused of fixing games. There are question marks over whether the case was politically-motivated. But regardless of the case details, the lack of a championship rightly rankles with Trabzonspor fans – a very legitimate reason to feel hard done by. 5- Turkey has been going through major political convulsions in the past few years and it still seems to be rocky road as country seems polarised by a whole number of divisive issues. Do you think the world of Turkish football is immune to these current national crisis or is this institution also being compromised by political interference? Turkish football is certainly not immune from the wider political, economic and social convulsions that have shaken the country. Indeed, the book charts the way these currents seep into football. Most of the research took place in 2016 – a year marked by numerous bombings, conflict in the South East and the violent and bloody attempted military coup on 15 July. These events were very much at the forefront of the minds of the people I was meeting, affecting the way their clubs behaved and their fandom could be expressed. Football clubs are certainly compromised by political interference. Indeed, because football is such a huge cultural pastime in Turkey, clubs are prestigious institutions and politicians jostle over them for influence and favour. Hence we see a huge amount of interest and vast machinations surrounding the election of club presidents, sponsorship agreements and the awarding of contracts to build new stadiums. Yet at the same time, the Big Three Turkish clubs (Galatasaray, Fenebahçe and Beşiktaş) are three of the most robust institutions in the country. They are all older than the nation of Turkey itself, lay claim to tens of millions of fans each, and in general provide an anchor for many to daily life in the country. As such, a politician’s reach into them is somewhat limited. 6- For those who don’t have a clue, how strong are Turkish football teams in the current world stage? What do you think is their biggest individual or collective weakness? Turkey produces some of the most skilful footballers in the world. Turkey’s most famous footballer, Arda Turan, currently plays at Barcelona. In 2002 the Turkish national team reached the semi finals of the World Cup. But unfortunately Turkish teams are currently lagging behind counterparts elsewhere. The reasons are many. An important factor is the lack of investment and attention in youth development. Turkish clubs are comparatively poor at finding and nurturing talent; they often prefer to buy in players from abroad. Turkey has one of the highest percentages of foreign players in its top division. Too few resources are devoted to long-term planning and the top clubs are all mired in debt. But the fault is not solely Turkey’s. The amount of money that flows to other European leagues in terms of broadcasting rights – especially the English and Spanish leagues – means that clubs in those countries have significantly higher purchasing power, recruiting the best players, playing the best football, winning the trophies and hence feeding the disparity. The better comparison for Turkish football is probably countries like Portugal or Russia – nations which have had occasional success at both the club and national level, but who have in general historically found it hard to break the stranglehold of English, Spanish, German and Italian clubs. But never say never. My side in the UK is Leicester City – a team no one in Turkey had heard of until, in 2016, they did the impossible and won the Premier League as 5000-1 outsiders. As such, I would never rule out the prospect of a Turkish team gaining global fame and success.